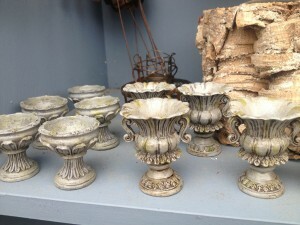 Oh my goodness…last week the first shipment of new miniature garden pieces came in – and what a delight! 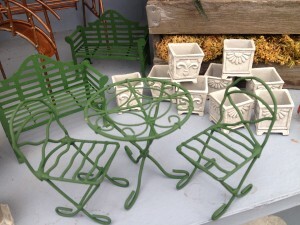 There will be even more in the weeks to come, but now we will content ourselves with brand new miniatures of weather vanes, picnic tables, tiny metal wagons and even the smallest bottles of wine for an early evening garden party..let your imagination go! 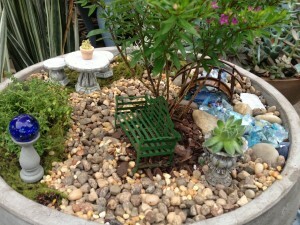 We have everything you need if you’d like a fun summer project with your kids…one of our customers had a great idea – she purchased containers, pea gravel, little rocks, plants and miniature garden accessories; then she put everything in the middle of a table and let the kids go to town putting their own miniature garden/landscape together. It is really so much fun, and even more so if you let them use their imagination…it’s amazing what kids can come up with! We even came up with a miniature garden for the owner, Billy Angell, pictured here – it had a temporary “cookie stack/cairn” because he is a cookie fiend! It’s really a very simple garden, using a stone bridge and Japanese lantern to create his “Zen” garden…this was in the middle of a hectic spring at the shop and we felt he needed a little calm in is life! 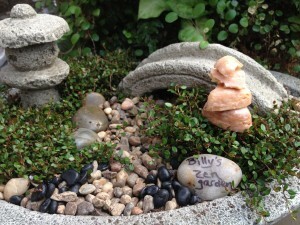 We added a little rock, and, using a sharpie, labeled it “Billy’s Zen Garden.” It made him smile – and isn’t that the point of these little gardens? don’t they look like the real thing? We’ve also gotten in some very detailed “concrete” urns, “retro” red tables and chairs (Remember the ones your parents or grandparents had? ), a sweet pair of frogs sitting on a cut log piece, a “stone” table with stools, and sets of tools, rakes and brooms – after all, you have to tend the garden and sweep the paths, right? If you’d like to have us put one together for you we have containers here, or you can bring something of your own in and we’ll create one for you. 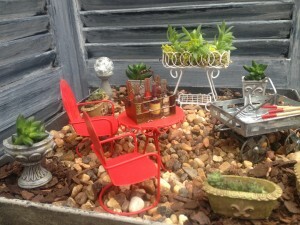 All we ask is that you give us ample time to put your miniature garden together – they may look less time consuming to make than a full size garden, but we promise you the devil is in all those minature details! Some plants that can be used for gardens that will be used outside are many low growing sedums, echevarias, hen and chicks, euonymous standards (They make great trees! ), tiny bromeliads, air plants and miniature jade plants to name just a few…indoor gardens (or terrariums) can be planted with fittonia, selaginellas, many small ferns, palms and more…there is always something in the greenhouse or in the nursery to use! 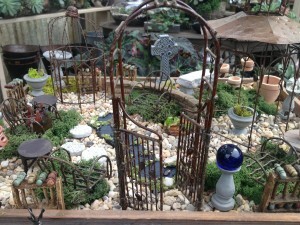 This entry was posted in Container, Miniature Garden, Miniature Gardens, Terrarium, Terrariums and tagged fairy gardening, miniature garden accessories, plants for miniature gardens, terrarium plants on June 16, 2013 by Kris Blevons.